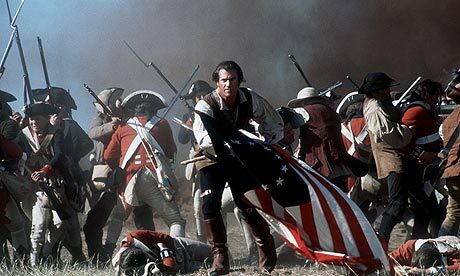 One of my favorite movies is “The Patriot” starring Mel Gibson. Of course, the moment where Gibson’s character takes his son’s flag and goes riding up alongside the militia is an awesome scene, even if you’re not very politically minded. However, there is some other cool stuff I am fascinated with in this movie including how they contrast the ‘old’ ways of fighting with the ‘new.’ The militia were not trained soldiers. Many were farmers protecting their homes, and fighting for their rights. In a face to face battle, they would not fare well, and had to resort to more guerilla tactics as a means for engaging the more highly trained armies. Okay, okay, so what does this have to do with Eve Online, you ask? I’ve played Eve now for four years, and have noticed that there are two types of general pvp. First, you have your big, null-sec pvp where everyone usually gets on the field and fights it out. This happens in empire occasionally as well, but I think it’s largely a tactic done in null-sec suitable for taking systems, eliminating an enemy presence, etc. Then you have your smaller gang warfare, which tends to be faster gangs in smaller ships. This style of pvp is general more suitable for engaging smaller fleets, eating away at the edges of an army, piracy, catching ‘small’ stuff and generally causing a nuisance. In small gang warfare, while you still may have an FC, each member often contributes toward creating and executing the strategy and tactics of the fleet in a more direct manner. Often, individuals must make split-minute decisions which will greatly change the outcome of an engagement. In large null-sec fleet fights, the actions of one member rarely turns the tide of an engagement. I like this, Susan. Only thing is that how EVE plays this scene out nowadays has the British winning every time. I think that's what's got a lot of people pissed about Supercaps Online and blobby fighting, but they can't put a finger on it EXCEPT to make vague references to "the blob" and "Supercaps Online": the simple fact that there really IS no mechanic by which a smaller gang can do significant damage to a larger force, especially one fielding capitals or supercapitals. Even if you could range-snipe the FC off the field, they'll have a backup, and the backup's-backup... and by that time your little gang is space dust.